Discussion in 'Middle East' started by MGB ROADSTER, Oct 8, 2018. A man and woman are pronounced dead after being critically wounded, while an additional woman is moderately wounded in the Barkan industrial area after a 23-year-old Palestinian who was employed there opened fire with an M-16 assault rifle; security forces are conducting a manhunt to capture the suspect. The woman who later succumbed to her wounds was found handcuffed on the floor. The 54-year-old told the paramedics she heard a loud noise and went to check its source. After seeing her, the terrorist shot at her and she hid under a table. woman in the head .. He will NOT live long Inshallah. Some 5,000 Palestinians are employed in Israeli-owned businesses in the Barken industrial area, Israelis and Arabs work together in the same place, living together in coexistence. Why is the BDS movement opposed to this cooperation? It is clear that this is the perpetuation of poverty among the Palestinian side. They want the Palestinians to continue to be refugees forever, to receive money from Europe and to be a bleeding wound in the Middle East. Russia decided on this type of policy back in 1972. In 1970 the Kremlin became interested in an obscure Arab construction engineer and collector of racecars, named Rahman al-Qudwa. Evidence shows, contrary to later claims, that this "construction engineer" was an Egyptian, born in Cairo during the summer of 1929. Rahman graduated from the University of Cairo and served as an officer in the Egyptian Army during the 1956 Suez campaign. Later he set up a business in Kuwait and made a fortune. He then entered politics, founding a hopelessly small terrorist organization.... According to the former head of Romanian intelligence, Lt. Gen. Ion Mihai Pacepa, one of the highest ranking communist defectors of all time, Rahman al-Qudwa became an important political ally of the communist bloc following the death of Egypt's president, Gamal Abdul Nasser, in 1970. Gen. Pacepa's account of Rahman's intimate relations with the communist bloc is related in a book entitled "Red Horizons."... 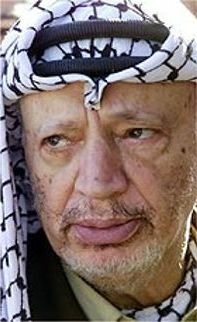 Rahman al-Qudwa is better known as Yasser Arafat, the chairman of the PLO since 1968 and the president of the Palestinian Authority -- which is now at war with Israel. According to Gen. Pacepa's account, communist dictator Nicolae Ceausescu ordered his people to bring Arafat over to Romania. In late 1970 the chief of Romanian intelligence in Egypt, Gen. Constantine Munteanu, arrived in Bucharest with Arafat in tow. Munteanu had gathered an extensive file on Arafat, which characterized the PLO leader as "so much cleverness, blood, and filth all together in one man." Pacepa says that this was Munteanu's "standard definition of Arafat." 1973 - Soviet statements and preparations for an attack against Israel led the Pentagon to order U.S. nuclear forces to the highest state of peacetime readiness. The Joint Chiefs of Staff ordered the 82nd Airborne Division to prepare to head to the Middle East, and additional U.S. naval forces -- including American aircraft carriers -- moved into the Mediterranean, all out of a real and rising concern that the Soviets were about to make an unprecedented military move against Israel. 1982 - Israeli forces battling PLO terrorists in southern Lebanon unexpectedly uncovered a secret but massive cache of Soviet weaponry in deep underground cellars and tunnels. The storehouses contained some 4,000 tons of ammunition, 144 armored vehicles and tanks, 12,500 pieces of small arms, and 515 heavy weapons. Then-Israeli Prime Minister Menachem Begin said that the Russians had prepositioned enough weapons to "equip not five brigades, but five or six [Soviet] divisions," adding that "we shall need literally thousands of trucks to evacuate these weapons from Lebanon." I'm curious why the M-16 seems to be becoming so popular. Its a horrible, horrible weapon. M-16 as in the 5.56mm rifle? What are you talking about? The Palestinian Jihadist shot her in the head with a "Carl Gustaf" rifle. The weapon is not horrible .. the murder is ! Yep, its becoming popular around the world. not sure i understand your line of inquiry here. Not sure why you are confused. I'm sorry but my statement was off topic but I was curious why we are seeing the M-16 pop up all over the world and being involved incidents when there are far superior weapons out there. The round itself has no stopping power, the gun is unreliable at best and plus its not easy to acquire one. a round with muzzle velocity of ~2850fps has no stopping power? Sure, if you get hit by 20 of them you may slowly bleed to death. Are you seriously trying to argue that the M-16 is a good weapon? That's a terrible news for the Palestinian working on the Israeli side as well as with the Israeli employers. well, compared to a russian ss-18 satan missile? no, i'll go with the missile. but the m16 has been the workhorse of us and nato forces for 5 decades. there are about 10 million of them in existence. granted we have almost finished the transition to the m4 in the us. but the 5.56 round is here to stay. but your argument sounds like "omg, really you think the f150 is a good pickup????" The M-16 isn't all that popular and the M-4 is replacing them. If you are talking about them being used for murder around the world, I don't see that. The typical weapon used for terrorism and run of the mill mayhem is usually the AK-47. You aren't talking about an AR-15 are you? I've just noticed quite a few news reports with M-16s being involved and it was rather curious to me. Haven't ever seen that in the past so it was surprising. Why anyone would choose an M-16 over an AK47 is beyond me. The M-4 uses the same round as the M-16 by the way. Its a different looking peashooter. I can find no mention of a M-16 used in any news story. A fully auto or burst weapon isn't easy to get your hands on and the US doesn't send these to every hot spot. BTW, I'm fully aware of the difference between an M-16 which I have fired, an M-4, and AR-15, of which I own one and parts to build more. You need to work on your research skills. ISIS appears to be making use of U.S.-made weapons in Iraq. A video released by ISIS' media arm in northern Iraq purportedly shows more than a dozen of the terror group's fighters undergoing weapons training — on American M16 rifles, according to Flashpoint Intelligence. Ah, so they intercepted a shipment meant for our allies the Kurds. Thanks. Yes and it makes me think of how much proliferation of that weapon is going on around the world because of similar circumstances. I have other links I could show you but I think you get the point. Whether people are using it more because its more readily available I don't know but I don't think it would be the preferred weapon. I am not an expert, but IMO the AK is a better fit for irregular combat. It is very forgiving of dirt and abuse and I've seen videos of someone shooting one until the wooden stock caught fire. The M-16 is more accurate but otherwise not a great fit. If they are showing up more perhaps it's because they are being retired and so end up on surplus markets or being shipped to militia groups we support. The AK will still dominate that market. That Israeli was killed in the West Bank which is not part of Israel. If them Israeli's don't like how they are treated for trying to profit from ethnic cleansing outside Israel, than they can always go back to their own side of the border and comply with international law. Your hatred and justification for the murder of a person ( In the West bank or anywhere else ) is horrible and disgusting. I long ago realized that many Jihado Arabo Muslims and their supporters are the essence of evil. No actually the US Army is moving to the 6.8. The 5.56 is an inferior bullet and since more and more adversaries are using body armor it is becoming more useless. Another problem is penetration through buildings since most fighting these days is in urban settings. M16s are inferior to AKs in just about everything except accuracy at long ranges but once again the vast majority of gunfights nowadays are close to medium range. And when these Israeli terrorists of illegal settlers do crimes against Palestinains, you shrug off. O ... sorry ... I forgot, for you are Palestinains automatically guilty and terrorists becauise being Palestinians eh? I am a firm believer of stand your ground law and that 2nd amendment is not to just look pretty. To kill a violent utterly racist intruder is not driven by hate, buddy. It's driven by my perfectly normal American patriotic norms and values. Tis perfectly normal to hunt them terrorists, eradicate and ethnic cleanse them and their families, demolish homes of them and their relatives, deprive them and their supporting lot of millions of American dollars.... I say, them Pelestinian terrorists suffer lots more than Israelis.